COLORADO SPRINGS, Colo., Aug. 30, 2018 /Christian Newswire/ -- Four NFL veterans have teamed up with Biblica, the International Bible Society (www.biblica.com), to throw their weight behind a sports outreach that aims to score with thousands of young people in South Asia through "the other football." Photo: Former NFL star Rashied Davis with participants in a soccer event in India who received a copy of Biblica's Game of Life book, featuring Scripture and testimonies of leading Indian soccer players. Matt Forte, Anthony "Spice" Adams, Rashied Davis, and Ray McElroy—who all played for the Chicago Bears during their careers—are helping provide free copies of Biblica's Game of Life book to young sports fans in a major new initiative. First published last year, the book is now the focus of a campaign to distribute 90,000 copies. Featuring testimonies of some of India's top names in Indian soccer—which is widely known as "football" outside the United States—the book is the latest in a long line of creative ways in which Biblica has presented the Bible to new readers. Being distributed at sports camps by Biblica's ministry partner, the Sports Coalition of India, the publication includes the books of Luke and Acts, and invites readers to explore a relationship with God. The subtitle on the pitch-green covers reads: "Believe it or not there is a game even bigger than football—it's called life." 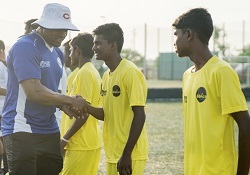 The former Bears have filmed endorsements for the India outreach, which will be posted at biblica.com/goal, and are expected to be shared through the players' own social networks. Biblica hopes the NFL stars' support will help raise the $30,000 still needed to fully fund the new effort, which is hashtagged #GoalCampaign. One of the Sports Coalition team members, Tamil, told how "really useful" the book has proved already. "People love the football players in the book," he said. "It mentions many football players' testimonies—how God changes their lives, about God's love and how God transforms people." According to Aldrin Bogi, Biblica's area executive director for South Asia, sports has helped in "breaking barriers between classes and castes" in India, making Game of Life "a great opportunity from a missions standpoint." He added: "While persecution is closing doors for conventional missions, sports will keep opening more doors. Our partners can use Game of Life to harness the power of sports not only to share the gospel but to promote life-affirming values in our society. "One big emphasis at Biblica is to translate the Bible in strategic languages of the world. Sports is not only a strategic language but a universal one." A "Biblica Ambassador" who has visited India to see the Game of Life outreach in action, Davis said that he was pleased to be able to support the initiative. "The book itself is exciting, because I know the power of a strong testimony," he said. "I see how sports changed my life and helped lift me out of hopeless circumstances. Jesus became a part of that and I know that it is the same for these kids. I see myself in them and want to help, as God opens doors."